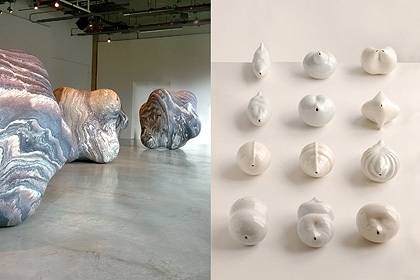 CERAMIC ART LONDON 2014 - DISCOVERY PROGRAM. 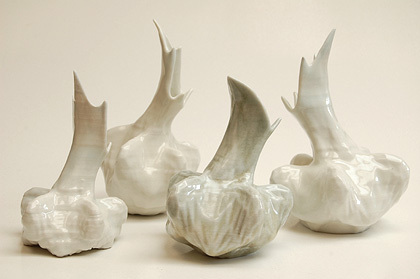 This is the tenth year of the existence of Ceramic Art London and it is held in the upstairs galleries of the RCA. 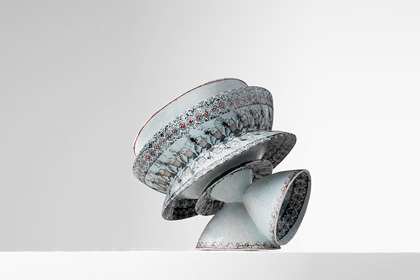 It has become established as a major showcase and selling fair for contemporary studio ceramics featuring work from leading national and international makers. During the tree day event there is a program of talks and presentations and I was invited so give one of the presentations. I was first up on the Friday with a talk entitled ‘Potting in a Digital Age’. 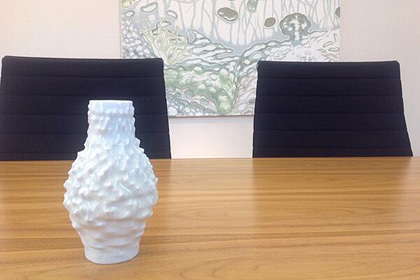 I had been asked to talk about the ceramic 3D printing I am doing and while that is part of the story as far as I am concerned what is most important is the way digital media is used to generate the ideas in the first place. I can understand how the printers are of interest and are what you can see, but ultimately they are only as interesting as the information that is feed to them. 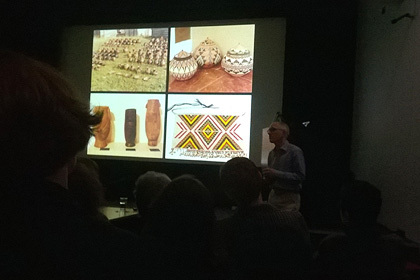 My talk was about why I use digital media, what it can offer and the ways of working with digital media and ceramic form. The presentation was well received with flattering comments made about the work and my attitude to mixing the new and the old. Afterwards I was approached by a commissioning editor of Bloomsbury Publishing who was interested to discuss ideas around digital techniques and ceramics. I also received an invitation to do a similar presentation and demonstration in Italy in the autumn during the Faenza Ceramics Festival. Looking around the fair, while there is lots to admire there were three stands that stood out for me and it turned out all were Belgium artists. Strong form always catches my eye but there was also a clarity, a confidence and a sense of a subject underlying the work. Although it turned out we have all exhibited with Annette Sloth in her gallery Puls (and could have been why I was drawn to this work) it was a real pleasure to speak with the artists and to see the work in London. TOP: Potting in a Digital Age presentation. The Capital of Culture organisers in Leeuwarden have picked up on the Godwit conservation story with its movement of population and cultural and environmental identity and are building it into the development plan for 2018. Hearing that I have been putting the texture and pattern of bird song and bird calls onto the surface of vases they asked if I could do a Godwit vase, or series of Godwit vases. This I did and then was invited out to Leeuwarden to do a couple of workshops demonstrating my 3D ceramic printing methods and to talk about my work. Then also to present to Jannewietske De Vries, the deputy commissioner of the Province of Friesland the first of the Godwit vases. Fifteen Godwits have been tagged with satellite tracking devices so the bird’s movements can be followed on the King of the Meadows website. Each tagged bird has been given the name of the Friesland town where it was tagged and so Jannewietske De Vries has been given the vase representing the bird from her village, Raerd and has been asked to look after it – bird and vase. BELOW: A YouTube extract from GPTV, the commercial channel of Friesland. 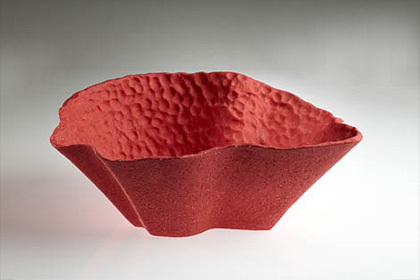 The video helps illustrate the making of the Godwit Vase. 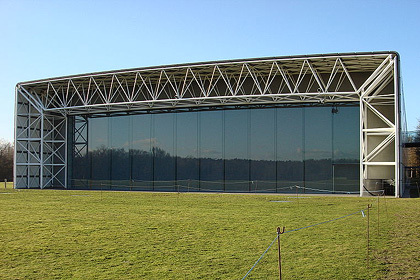 Hosted by the Sainsbury Centre for Visual Arts in Norwich this was a two day workshop that I presented. 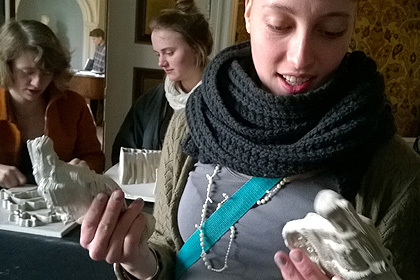 The workshop was aimed at participants with no or little knowledge of working with digital 3D technology. I offered an introduction to the open source 3D modelling software Blender and then went step by step through how to build a simple digital 3D model. This was then exported as a stl file, imported in the Repetier- Host (also open source) that converts the model to gcode ready to go to the printer. With two clay printers running all 15 participants managed to print at least something with some printing two objects. It was a steep learning curve for some and in two days just coming to terms with the software is difficult but it is a quick way to get an insight into what might be possible. ADDITIVE MANUFACTURING – WILL CERAMIC AND GLASS POWDERS MISS OUT? This was a one day symposium organised by the powders section of the Materials Knowledge Transfer Network (KTN), a government supported body. The aim was to bring together three different industrial sectors that rely on ceramic materials and structures - tableware ceramics, dentistry and orthopaedics, in the hoped of generating synergy and a sharing of ideas. Also to consider commercial drivers and technical challenges that would stimulate suggestions for a way forward. I was invited to give a presentation about the ceramic 3D printing I am doing. It was a most informative and interesting day with a balance of academics, industrialists and material/service providers. 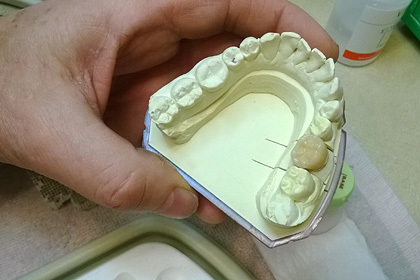 Presentations on development in the use of 3D printing in surgery and some parts of dentistry were inspiring but I came away quite shocked how little work is being done in the area additive manufacturing in the ceramic pottery industry. I can see with the current technology there is no immediate gain or obvious application. While as to the future there was talk and speculation but no serious research or development going on. BOTTOM IMAGE: The symposium day was held at the Digits2Widgets 3D printing and additive manufacturing bureau in Camden, central London. 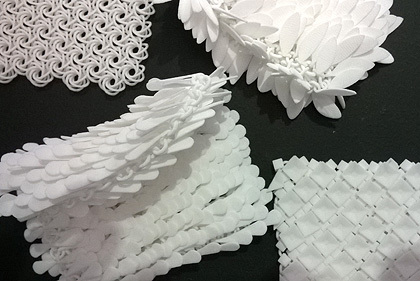 D2W have been developing a range of 3D printed fabric samples that were very interesting to see. As was a tour of the studios and to see the services on offer. 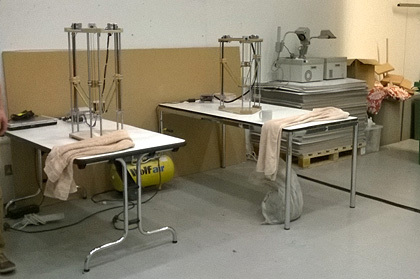 3D FORMLAB COLLABORATION – ENGELSHOLMN, DENMARK. This was a great illustration of the new ways of working that digital techniques can offer. 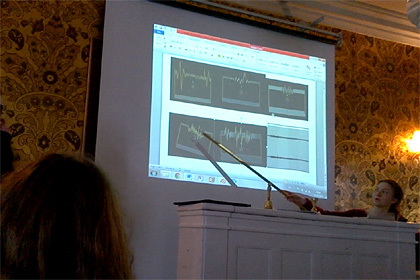 I was invited back to the Engelsholm Folk High School in Denmark to help facilitate with the resident staff a one week collaborative project between the schools digital music department and the 3D formlab. Student where put into groups of four, mixing music and 3D students. The aim was to move back and forth between sound and 3D as many times as possible during the week. The idea was to create sounds and music from the objects and material in both the ceramic and glass studio (formlab) and then to produce objects in either clay or glass in response to the sounds and music. As a start each tutor gave a short presentation with suggestions on ways to approach the collaboration. 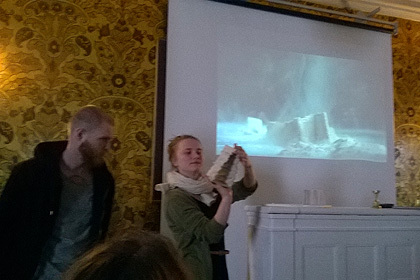 The tutors were David Mondrup and Mikael Elkjaer digital music, Marie Retpen, glass and myself for ceramics. 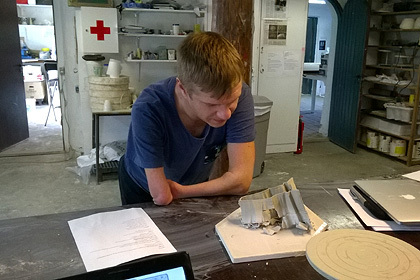 Claus Domine Hansen runs the ceramics department but he was away for the week. Throughout the program the tutors worked closely with the students offering digital tools and offering solutions to often wonderfully stimulating but difficult to execute ideas. Such as the unsuccessful clay long playing record. The week ended with each group doing a presentation of their progress. The emphasis was always on the process and not ultimately finished product but I was bowled over by what the students had managed to achieve. Themes ranged from commenting on the idea of 3D printed guns, exploring the sound and ceramic printed 123D Catch scan of a toy gun, to cave sounds with modeled animals (analogue techniques included) mixed with code generated (Processing) 2D screen based animations. 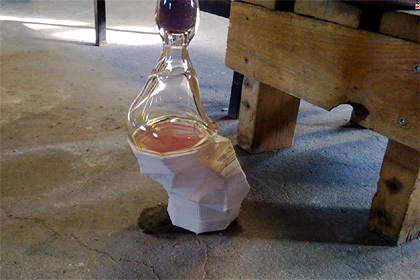 For me one of the most moving images was a video of a bone dry ceramic printed shape that had been formed from the screen wave profile of sound visualisation slowly dissolving in water in a glass box set to the recomposed soundtrack of the noise of the dry clay rehydrating underwater. A project that has to be repeated. 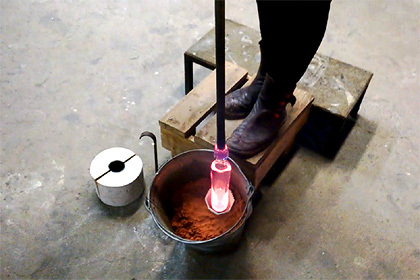 Back in 2011 I set up a clay 3D printer at the art school in Stockholm at the invitation of glass blower Charlie Stern. Charlie has since been experimenting with printing clay mould to blow glass into. At the end of last year I similarly installed a printer at Engelsholm Folk High School in Denmark. At the time I spoke with Marie Retpen who teaches glass at the school about what Charlie was doing. On returning to Engelsholm in March this year I found Marie experimenting with clay printed clay mould for glass blowing. Marie was having problems with the bisque fired moulds cracking open when the hot glass was blown into the printed form so we tried embedding the mould in sand that will contain the shape even if the mould breaks. 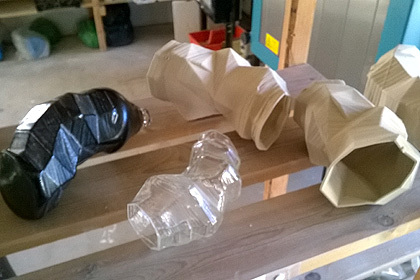 TOP: Blown glass and moulds. MIDDLE: Glass blown into bisque fired printed clay mould. 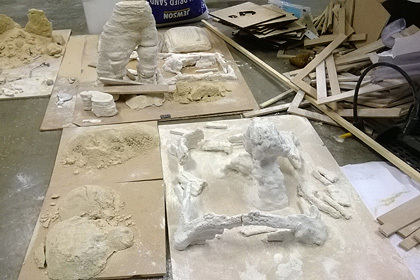 BOTTOM: Mould packed in sand to stop cracking apart. 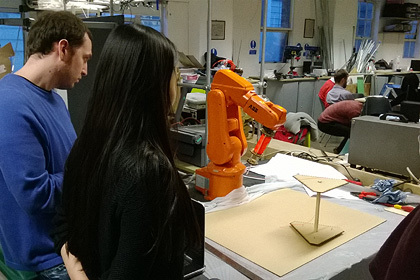 ROBOT ARM CERAMIC 3D PRINTING - BARTLETT SCHOOL OF ARCHITECTURE, UCL. 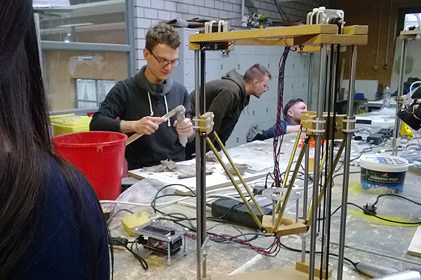 I have been approached by Gilles Retsin who teaches one of the clusters on the MArch program at Bartlett School of Architecture, UCL to help and advise with attaching a clay extruder to an industrial robot arm. A project I have wanted to do for over a year as I see the use of a robot arm rather than a 3D printer as the way to scale up the computer generated work I am doing to the size of the floor pots I have made previously. 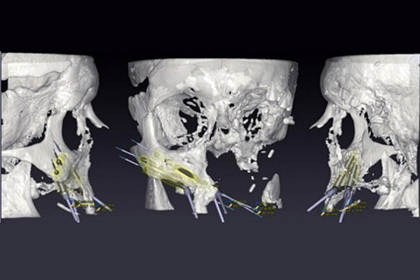 The aim of the MArch research cluster is to explore the latest approaches to robotics and computational generative design, using advanced algorithms and extensive material experimentation. With an increase in the possibilities of digital and computer-controlled fabrication architects can design for infinite resolution and density of information. 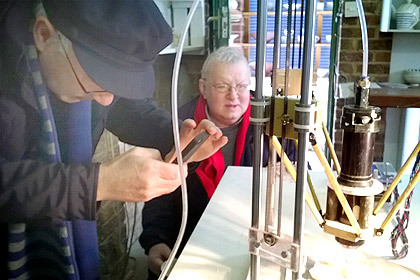 However there is a lack of design methodology to harness this potential and this course concentrates on speculative research into practical ways of using this technology. The film and game industry has made use of computational power to generate new and intriguing images. Data visualisation has exposes the hidden beauty, and complexity of observed systems, but data materialisation and fabrication has not achieved this. When compared to, for example Gothic architecture, computational experimentation is not capable of practically and successfully delivering the same level of fine detail and information-density. For me this contact with the architecture school has been most stimulating and an eye opener to see just how fluent students and staff are with digital techniques. It just confirms for me how far behind ceramic education is with the development of digital ways of working. MIDDLE TOP: Setting up the small robot arm. MIDDLE BOTTOM: Experiments with layered powder bonded using liquid deposited with the robot arm. 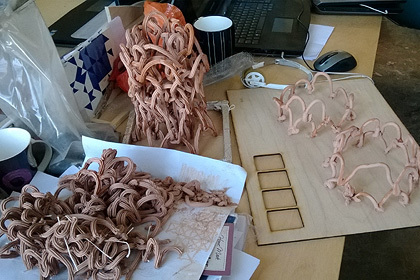 BOTTOM: A room of eight Replicators all buzzing away making architectural models. On arrival at Plymouth University I could not miss the three large Peter Randall-Page sculptures that had been sited outside the design building. My lecture was well received and as it was delivered to all of 3D design department I did not make it too ceramic centred and covered more was of working with digital tools, both hard and soft. Soft tools covering Processing projects where I use computer code to generate forms and hard tools in the self built 3D printer to get the digital information out of the computer and into physical form. I spoke of my interest in natural patterns and systems, showing drawings based around symmetries and forms generated from spherical harmonics. Afterwards I was told I must see the Randall-Page exhibition in the Peninsula Arts Gallery downstairs and the city museum across the road. I did to be quite shocked at the similarity in our work, although the scale is quite different as is the techniques we are using. 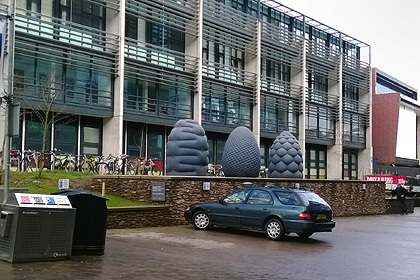 TOP: Peter Randall-Page Fructus, Corpus and Phyllotaxus outside the Peninsula Art Gallery, Plymouth University. MIDDLE: Left, Randall-Page Harmonic Solids series, left my porcelain 3D printed Spherical Harmonics series. 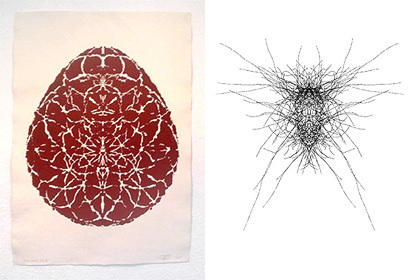 BOTTOM: Left, Randall-Page Euclidean Egg drawing based around symmetries as are my Double Doodle digital drawings series, right. 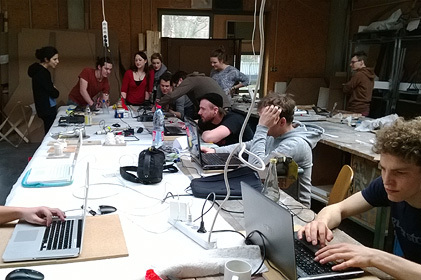 I was invited by Professor Aart van Bezooyen who heads up MAKE, a platform for materials and technology at Burg-Halle University in Halle near Leipzig to run a workshop to experiment with paste materials in the DIY 3D printer. 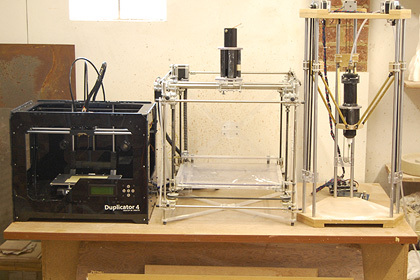 MAKE had made their own delta 3D printer from the directions on my website and I took over a printer so we had two machines running and the idea was for students to export as many different types of materials as possible to print. 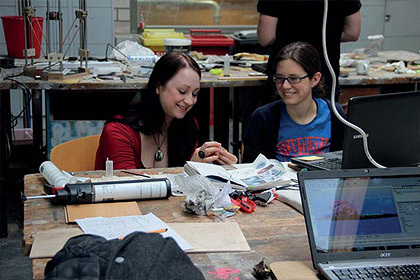 MAKE does not run a course of its own but rather offers workshops for students to participate in from across the university’s design and fine art schools so there was an interesting range of participants. 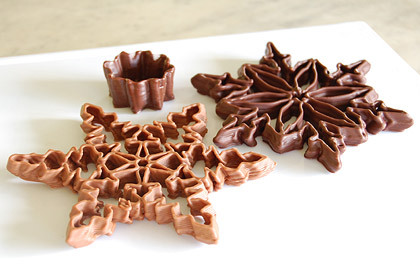 Students tended to work in pairs and we tried 3D printing with locally dug clay, builder’s silicon, wax, sugar frosting, sugar sticks and sugar fondant, wood paste and I had tried chocolate as way of preparation. Those materials that would work with the pressurised syringe type printhead did well. Wax and sugar where heat controlled print heads were required proved to be more tricky but with persistence, that the students and staff certainly showed, I am sure could be made to work. I have set up a fascinating dialogue with Enrico Coen and Andrew Bangham who both head research labs at the University of East Anglia in Norwich. 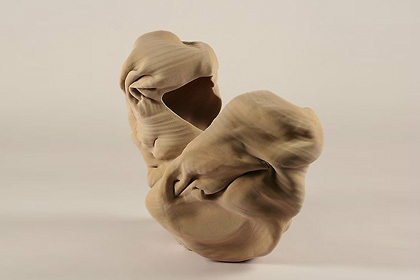 Having heard on BBC Radio about the collaborative work they have been doing on growing biological shapes through computation I made contact and fortunately they were interested for me to try and 3D print in clay one of the shapes that they had generated. They have already been collaborating with London based artist Rob Kesseler and so we are hoping that a four way collaboration could develop. I needed to alter the computer mesh that I was sent a little to have a flat base to start printing from otherwise the shape printed is as grown in the computer simulation. Having been invited to give a workshop on 3D paste printing on the materials course at Burg-Halle University in Germany I thought I must give printing chocolate a go in preparation. 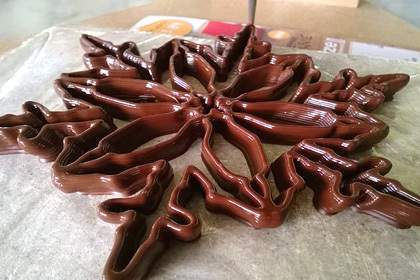 Chocolate is an interesting print material and with more time I think you could do some interesting things with it. Having a melting temperature of under 30°C (above it goes granular) and then re-solidifying at room temperature it has a very narrow working potential for extrusion. 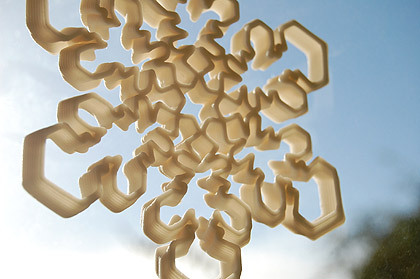 However the ability to go from solid to liquid and reverse makes it a good material for extrusion 3D printing, if you can control the temperature. 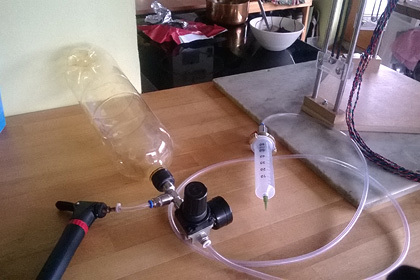 Predicting that liquid chocolate would not need much pressure to extrude I abandoned my normal studio air compressor and cobbled together a fizzy drinks bottle compressed air system. I believe a fizzy drinks bottle can withstand up to 6 Bar of pressure so with my bicycle pump and only pressurising the system to 1 Bar it was not stressing too much. The pressure needed to extrude the chocolate as I turned up the regulator did not register on the pressure gage so I cannot say what it was but the rate of flow was controllable. One priming of the fizz bottle with the bicycle pump was enough pressure for a syringe of chocolate. I began printing onto cling film, then gloss card, on top of a ceramic tile that I had put into the deepfreeze. This was to help re-solidify the chocolate as it printed. To print tall objects this cooling technique will need to be improved as beyond a couple of centimeters in height the liquid chocolate was not solidifying sufficiently before the next layer came around. However with a syringe, bicycle pump, and fizzy drinks bottle this print head could be cobbled together and attached to any RepRap type 3D printer. Give chocolate a try. 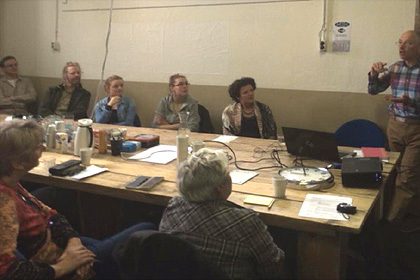 The second meeting of the 3D Print Schools Comenius project was hosted by Erikslundskolan, General secondary school the partners in Boras Sweden. 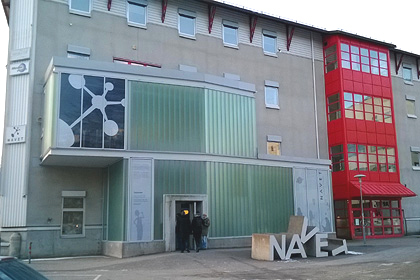 With the Navet Science Center as support institution to the school this made for a most interesting visit. Discussion was mainly about how to introduce 3D printing into the school curriculum. What subject areas it will be most useful for and the what sort of digital tools or software are available and useful to schools. At Alde Valley with the afternoon 3D print club we have asked students to look at Tinkercad, Sketchup, 123d Design and Blender (all free software) as possible 3D modelling software options. Each software has its advantages and disadvantages ranging from some being better for architectural type modelling and others more organic modelling. The learning curve of the different software’s is also problematic with Tinkercad being the easiest but having limitations to Blender being a serious option that students can grow with but it is a daunting proposition to initially learn. On the hardware side the Duplicator (Chinese copy of the MakerBot Replicator) is doing a good job bathed in its mysterious blue light. 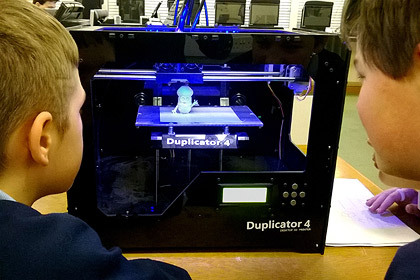 In my advisory role to Alde Valley High School, Leiston with regards 3D printing they were looking to get a plastic printer. 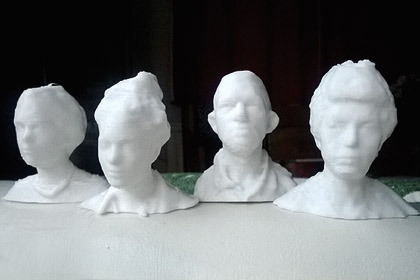 Feedback from the Schools Comenius project that the school and I are involved in has shown that problem areas are that 3D printing is slow and while the results are amazing the standard of plastic DIY 3D printing leaves a little to be desired. The decision was to go for value for money but still have a machine that looked good – looked like an emerging technology. My advice has been to go with a Wanhao Duplicator. It is a Chines manufactured copy of the US open source Makerbot Replicator. 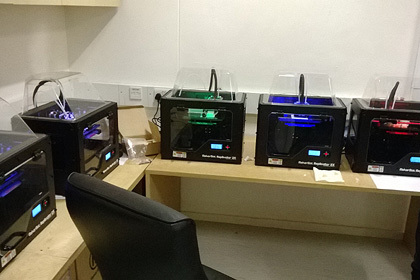 Printme 3d based in London sell these machines and will do a good offer to schools and education institutions and by the time the VAT is got back and depending on what model you get the cost is around £ 700.00. Having not printed in plastic I needed to get up to speed with the machine and what better way than get out the Ipad with 123D catch and print a mini me family. With my interest in natural systems and patterns, snowflakes had to be looked at some time. In Processing I edited out a vector drawing tool that included six fold symmetry. 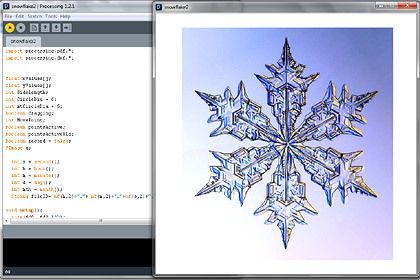 By loading photos of snowflakes into the view window one symmetrical edge could be traced and a complete profile exported as a .dxf file. Imported in Blender a 3D object could then be extruded from the 2D image. 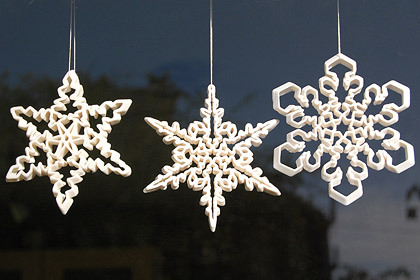 Printed in porcelain they made for good Christmas decorations, if a bit delicate.